The closest thing to a cure for acne is an acne treatment that is proactive in preventing future breakouts. 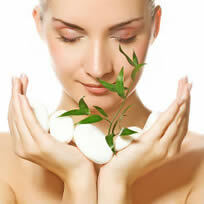 There is no sure solution for acne, but a treatment that fortifies the skin is close. Designed to help adults who struggle with acne, TriDerma Adult Acne Healing Gel claims to be the best treatment, but we are not so sure. We need to look closely at the ingredients before we can recommend using TriDerma Adult Acne Healing Gel. TriDerma is a healthcare and beauty brand that provides medical strength treatments for a number of ailments, including acne. TriDerma developed Adult Acne Healing Gel as a fast-acting remedy to accelerate the healing process of acne for a quick and clear complexion.The Adult Acne Healing Gel can actually be used on all types of acne at any age. The formula combines a number of common ingredients to layer the skin with skin-healing agents. In order to have medical strength, Adult Acne Healing Gel combines 2.5% salicylic acid, AP4 genuine virgin aloe, and allantoin. Salicylic acid is the active ingredient in the treatment that fights acne by removing dead skin cells, clearing pores, and helping alleviate inflammation. Salicylic acid is a popular over-the-counter acne medication. Alongside salicylic acid is the antiseptic AP4 genuine virgin aloe. AP4 has the power to kill bacteria that causes flare-ups while allantoin soothes redness for smoother looking skin. 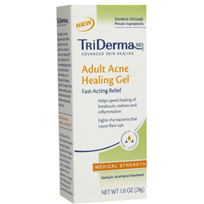 Is TriDerma Adult Acne Healing Gel Safe? The power behind the product also comes with minor side effects. Salicylic acid can cause temporary skin irritation, dryness, and redness. 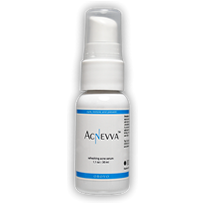 Overall, Adult Acne Healing Gel targets existing acne and attempts to fortify the skin from breakouts. The formula has nothing particularly advanced to help shield the skin, but it is can be a beneficial treatment for mild to moderate acne.People who suffer from severe acne or who have sensitive skin should consider alternative treatments with more skin-conditioning agents. First of all, if it’s a serious pbrloem then you should see a Dermotoligist. They can tell you for sure if it’s adult acne, or just a hold over from your younger days. Also, alot of young women make the mistake of try’in to cover acne with make up, which tends to make the pbrloem even worse. If you wear make up, be sure to wash your face daily to cleans away the excess soo that your pores are open and the dirt and oil does’nt get trapped inside them. 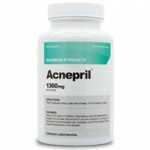 If the doctor says that it is Adult Acne, then he may prescribe a prescription cleanser for your face which will be stronger than anything you could by at the local drug store. But being watchful of things like make up and washing your face often can go along way. Good Luck.